I was watching Wayne’s World on Saturday night – like everyone else on the internet, I believe – when I had the #totesoriginal plan to see if I could find a Wayne Campbell cap on Etsy. Just for shits. Didn’t get as far as the hat, because I was distracted by these lilac resin Garth & Wayne photo earrings from seller, Pixie. I can’t imagine a time I’d wear them (apart from, I guess, all the time) but I do know I want them to be mine. I’ve discussed before the fine line between mad art teacher and something actually a bit cool and different and this season’s ridiculous cocktail earrings definitely fall into this perilous category. I love big, gaudy plastic gems – but they definitely need a bit of sparkle or something to make them non-wacky. Miu Miu are (as usual) at least party responsible for the trend – their Swarvoski/plexiglass lightning bolts are ostentatious but still feel pretty cool to me. Oh and Sharmadean Reid has them – you can’t argue with that kind of evidence. D&G also did lol-jewels with their farfalle fancy-pants chandeliers. I mean, it’s a bowtiwe pasta and some gold virgin Mary medallions attached to a big crystal. There is nothing there that I can’t get behind. 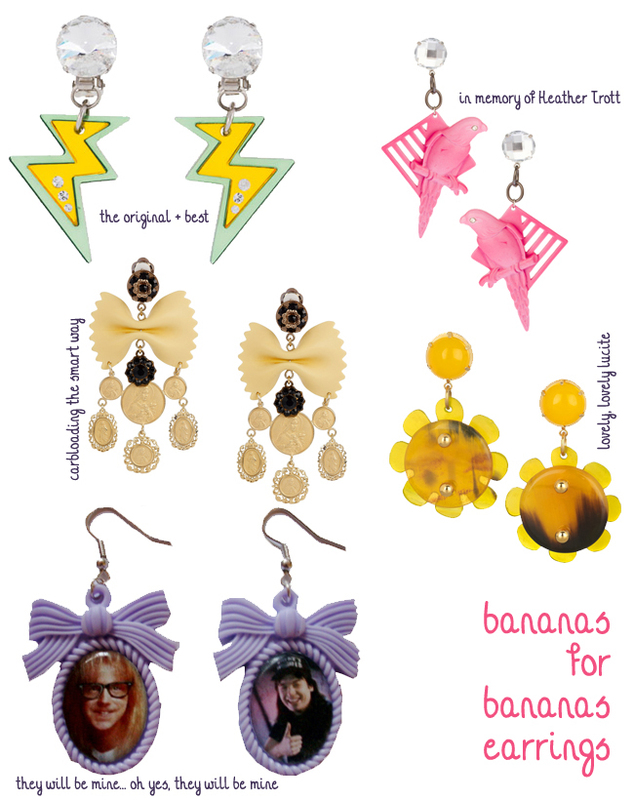 The ASOS pink parrot drop earrings are absolutely enormous – click on the model pic if you don’t believe me. I think they’re a bit Club Tropicana/Heather Trott’s funeral but I admire the gusto of any retailer who can say yes to giant pink birds hanging off a big square, in turn hanging off an imitation diamond. Slightly more tasteful, Marni’s horn and resin sunflowers are just art-and-craftsy enough to fit the bananas theme, but tasteful enough for that guy at work not to ask me questions. I share your passion for art teacher earrings, and more generally art teacher accessories such as ridiculous scarves and kitsch necklaces. Oh I LOVE a scarf. I very rarely wear them but I can’t help buying them alll the time. My favourite is a very ostentatious Lady of Guadalupe with GLITTER.